Does Memorial Gallery, Inc. offer an awesome collection of dog memorials? Do schnauzers bark? They sure do! We had one for 17 years (see About Us). And Memorial Gallery Pets definitely has one of the most awesome collections of pet urns for dogs available anywhere. Looking for a great urn value? Check out our solid hardwood dog urns at the top of the product listings below. These urns are 100% solid shesham hardwood which is kind of a cross between rosewood and teak. Very beautiful and substantial. And the prices are very reasonable, starting at just $29.99. If It Looks Like a Basset, It's a Basset! Dog breed-specific figurine urns, as the name suggests, feature life-like breed sculptures on the top of a quality wooden pet urn. There are dozens of breeds available. And, for the more popular breeds, there are multiple poses (standing, sitting, etc). Elegant Photo Wood Large Dog Urn- Free Engraving! 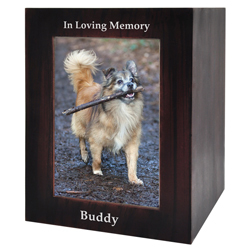 Dog Urn- Pet Memorial Wooden Pawprint Memory Box. Paw Print Cremation Urns- 6"
Small Pet Urn- Elegant Pewter 6"
Pet Urns- Shiny Turquoise Cremation Urn- 6"
Pet Urns- Cherry Red Urn- 10"
Pet Urns- Cherry Red Medium Urn- 6"
Scarlet Brass Pet Urn 6"
Pet Urn- Golden Classic- 6"
Pet Urns- Butterflies Purple Cremation Urn- 6"
Pet Urns- Butterflies Purple Urn- 11"